Dr. Ichiro Taniguchi, former president of AIAA-JFSC passed away. Dr. Ichiro Taniguchi, who was the president of AIAA-JFSC from 2001 through 2003, suddenly passed away on 1 November 2009. He was 72 years old. Chairman and CEO, JSAT International Inc.
"Horizons-1 is principally used for business-to-business communication and digital divide measures, taking advantage of its 50 state coverage, including Alaska and Hawaii. Horizons-2 is primarily used to support government related and media contribution networks." We interviewed with Mr. Osamu Inoue, Chairman and CEO of JSAT International Inc. The 15th Ka and Broadband Communications, Navigation and Earth Observation Conference was held on September 23-25, 2009 at Cagliari in the Sardinia Island, Italy. The name of the conference is fused in three fields of communication, navigation and remote sensing this time. Furthermore, vanishing a special feeling to the Ka band, optical field is added and it was placed in BroadSky Workshop in the conference before last, then it has been treated as a session in the conference since last year." This is a report of attendance at the Ka & Broadband Communication Conference and a brief report of visiting the Marconi Museum in Bologna on his way home to Japan. The 60th International Astronautical Congress (IAC) was held at the Daejeon Convention Centre in Daejeon, Republic of Korea, from October 11 to October 17, 2009. This is a report on the conference, mainly on the symposium of Space Communications and Navigation Committee (SCAN). 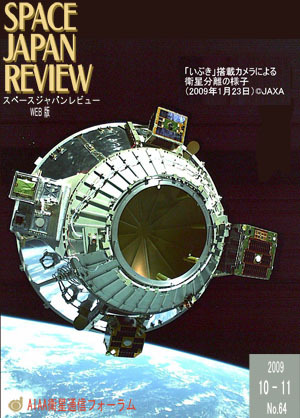 At World Radio Communication Conference (WRC-03) held in June, 2003, the discussion concerning "Earth Stations onboard Vessels (ESV)" that can communicate high speed and a large capacity in the sea was done, and ESV became possible the communication to satellites in fixed satellite services using the C-band (6/4GHz) and Ku-band (14/12GHz). The maritime satellite communication services that INMARSAT was providing attempted the speed up to 432 kbps from past 64kbps by recent INMARSAT FB (broadband Fleet) in L-band. As for the service in Ku-band introduces by this article, the data rate of 1Mbps in downlink by best effort and 512 kbps in uplink can be achieved. By mutual roaming connection between the SP-JSAT and U.S.'s KVH, this maritime satellite communication service will be available in the major marine areas. Through the Internet available even on the sea, the crews and passengers will obtain the weather forecast and the latest world news anywhere in the world. It will be useful also for safe ship sailing. I would expect Ku-band and Ka-band (30/20GHz), which have not so much been used for mobile applications, extend their usages in new satellite communications services. Satellite communication systems have been used mainly for broadcasting pictures of teachers and students and presentation materials in the field of education by taking advantage of its wide bandwidth and wide coverage. As collaborative learning leads to higher level in education, our activities focused on the collaborative learning environment. Through workshops, which were held at 10 sites in 6 countries 30 times for two years on satellite channels, we have learned the importance of multisite collaborative learning environment and easy operation of satellite communication equipment. An inter-university collaboration network using a satellite was proposed by NIME (National Institute of Multimedia Education) and was realized under the name of SCS (Space Collaboration System). More than 159,000 site �~ hours of collaborative activities were conducted among 150 stations in 123 universities and colleges for 13 years. The inter-university collaboration system motivated and encouraged participants in their studies and researches, and the experiences concerning distance education and collaborative activities were accumulated in universities, which will lead to the improvement of the quality of education.